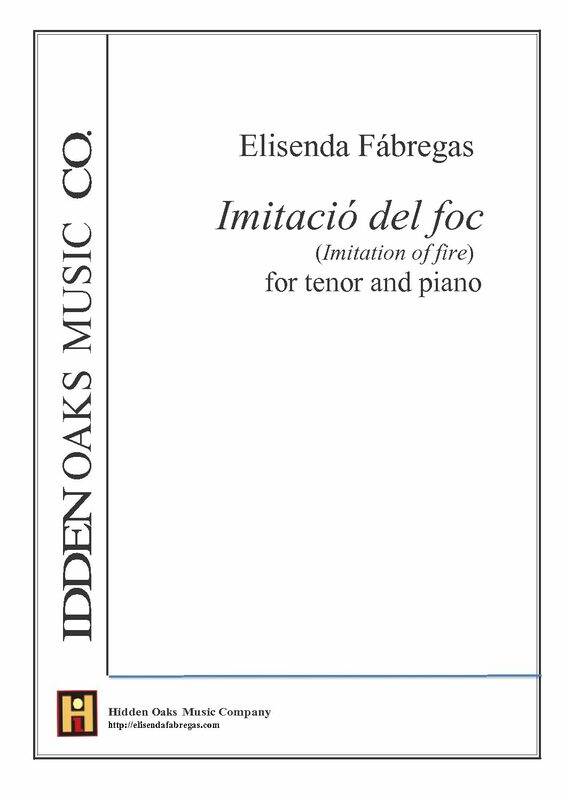 Imitació del foc (Imitation of fire) for tenor & piano is a song cycle for tenor and piano based on four poems in Catalan by Bartomeu Rosselló-Pòrcel (1913-1938), a Spanish Balearic poet, who wrote in Catalan. He died of tuberculosis at the age of 24. He has a brief oeuvre but dense. His mature work, Imitation of fire (1938) turns him into the first Mallorcan poet who fully belongs to the twentieth century. Once the influence of the Mallorcan School has been overcome, the poetics of this last book are influenced by the generation of 1927, as well as by the avant-garde and specifically surrealism. There are also echoes of his interest in Spanish Baroque literature, along with a neo-populism similar to that of García Lorca or Rafael Alberti. In Rosselló-Pòrcel work is notable the presence of the symbol of fire, and related words, such as fire, flame, ash, charcoal burning and bonfires. The use of these symbol is not purely ornamental, but it reveals a deeper sense. The fire for Roselló-Porcell is purification, the struggle of opposites, light, life, rise, movement and perpetual change, immateriality and mastery. This vision of the fire connects Rosselló-Porcell directly with a pre-Socratic philosopher, Heraclitus, who found in fire an overcoming of all processes of change that view reality. The four poems selected in this song-cycle come from the collection Imitacio del foc and Quadern de sonets (an earlier work). This opening piece starts brilliantlly with tolling bell-like sounds calling for the parishioners. The spiritual symbol of church bells can be associated with the creative power, poetry and its followers. Rossello’s poem describes the poet in the evening hearing church bells and settlying at dusk into his home as a metaphor for internal search. Escolto la secreta…(I listen to the secret…) from Imitacio del Foc, Arbre de Flames). In this poem the poet explores the relation between himself and death when he “listens attentively to the secret harmony of the air and the ardor that trembles from great free waters.” The music is intimate and personal evoking the inner life and reflections of the poet. Pluja brodada (Embroidered rain) from Imitacio del foc, Fira encesa, written in 1938, is a poem in which the poet extols and personifies the rain, a natural element, in a precious manner, first reminding us of the sound of rain in a graphic manner. At the beginning of the poem the rain ‘dances’ joyously but little by little takes on a restless character. The music evokes the sound and moods of the rain; the tímbric sound on the rain is portrayed by sparkling arpeggios in the higher register of the piano. Ardent himne (Ardent hymn) from Imitacio del foc, Arbre de Flames, written in 1938. This poem states the dichotomy between the poet and the angel. The text is imbued with action and extraordinarily dynamic power, with fire contrasting with angels (‘homes alats’) and the night, portraying a vision of the world as a fight between contrary and opposite forces that need each other to exist. Commissioned by the 2015 Barcelona Festival of Song and director/soprano Patricia Caicedo. 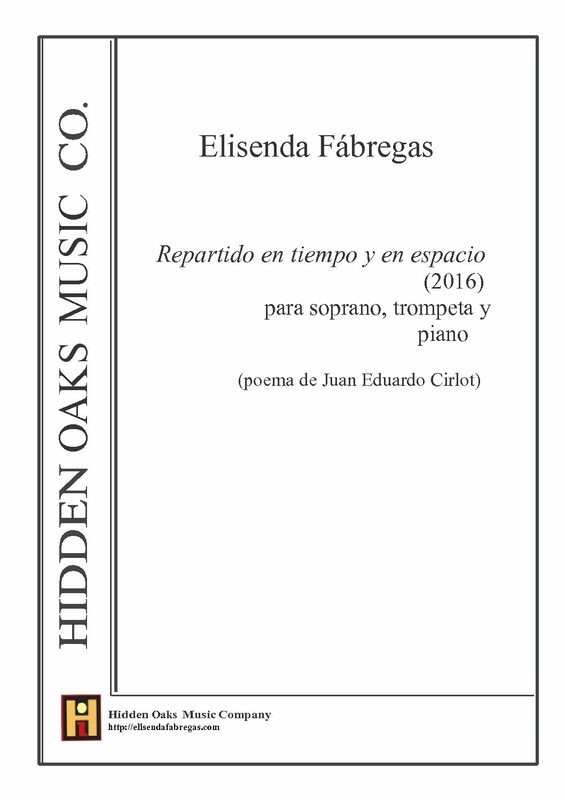 Premiered on June 27, 2015, by Patricia Caicedo, soprano, Lenine Santos, tenor, and Nikos Stavlas, piano. Tiempo de amor (Time for Love) (2015) for soprano, tenor and piano is set to texts by Andalusi poet Ibn Zaydun (1003-1071) and princess Wallada (1011-1091). Both poets were born in Cordoba at the height of the Al-Andalous culture in Spain and were known as the lovers of Cordoba, due to their passionate love relationship. The text used in this work are fragments of the letters they wrote to each other, which have come to us through Wallada in the form of poems. The Triple Concerto for Piano Trio and Orchestra by Elisenda Fábregas is a reflection on the state of coexistence among diverse populations of the world and an homage to the unique medieval culture of Al-Andalous in Spain, a culture in which three diverse populations – Arabs, Jews and Christians – coexisted harmoniously for almost eight centuries. Metaphorically, these three populations are represented by three soloists – sharing equally the limelight, interacting with each other, and dialoguing with the orchestra. There are three movements, each with a tripartite structure. The first movement (Allegro moderato) features haunting harmonies and pleading melodic gestures evocative of flamenco, as well as an exciting cadenza-like passage for the three soloists in the center. The second movement starts and ends with a Pensaroso (Pensive) section that flanks an intense Appassionato and a triumphal section marked Con resoluzione. The third movement (Allegro deciso) is distinguished for its energy and rhythmic vitality, with an expressive and quasi-religious passage in the center played by the violin and the cello. Duration: 9′ 30″ Based on three poems (in Spanish) by Federico Garcia Lorca from the collections Diwan del Tamarit (1931-1934) and Canciones. Commissioned by and written for Christiane Meininger, flute; Jörg Waschinski, male soprano; and Rainer Gepp, piano. World premiere at the Zentrum for Information und Bildung in Unna, Germany. Sponsored by the American Embassy in Berlin, the Center for International Light Art in Unna (Germany) and a travel grant from the Peabody Institute of John Hopkins University.